Max Browne is a Fuseli, Blake and Holst enthusiast and collector. He recently organized the first exhibition devoted to Holst and wrote the catalogue The Romantic Art of Theodor Von Holst (Lund Humphries, 1994). Martin Butlin was formerly Keeper of the Historic British Collection at the Tate Gallery, where he was in charge of the notable groups of works by Blake and Turner. He is now a consultant at Christie’s. Stephen Cox, Professor of Literature at the University of California, San Diego, is the author of “The Stranger Within Thee”: Concepts of the Self in Late-Eighteenth-Century Literature, and of Love and Logic: The Evolution of Blake’s Thought. Keri Davies is Chair of the Blake Society at St James’s. He is currently researching Blake’s contemporary collectors. Michael Ferber is Professor of English at the University of New Hampshire. His most recent books are the Blake and Shelley volumes of the Penguin Critical Studies series. William F. Halloran, Professor of English, University of Wisconsin-Milwaukee, has returned full time to teaching and research on Blake, Yeats, William Sharp (“Fiona Macleod”) and others after an inordinate number of years as dean. Yoko Ima-Izumi, Associate Professor of English at the University of Tsukuba in Japan, has published essays on Blake, romantic literature, and film. She is currently working on three books: Blake’s Re-Vision of the Female (in Japanese), Romantic Poetry and Postmodern Film (in Japanese) and Women in Japanese Film (in English). Andrew Lincoln teaches in the School of English and Drama at Queen Mary and Westfield College, University of London. 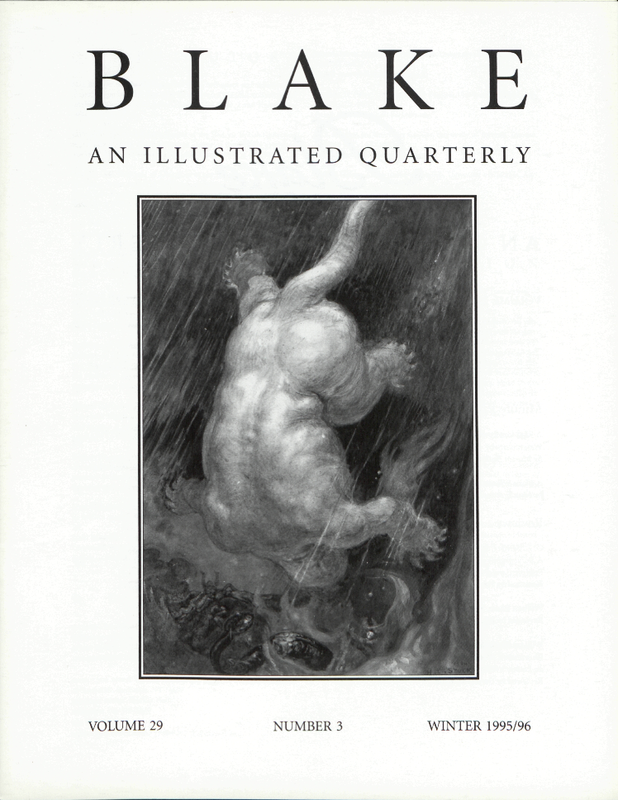 His book, Spiritual History: A Reading of William Blake’s The Four Zoas was recently published by Oxford University Press. Harriet Kramer Linkin teaches courses in Blake, romanticism, and gender at New Mexico State University. She is currently co-editing Approaches to Teaching British Women Poets of the Romantic Period for the MLA and writing a study on the poetry of Mary Tighe. Dennis M. Read is an associate professor at Denison University, where he teaches courses in literature and writing. Janet Warner is Professor Emerita of English, Glendon College, York University, Toronto. She is now living on five acres near Vancouver, British Columbia, and studying garden design. Cover illustration: Henry John Stock (1853-1930), The Beast cast into the Lake of Fire.